The LC Series is ideally suited for volume use in OEM applications such as remote control, security, identification, and periodic data transfer. Housed in a compact surface-mount package, the LC Series modules utilize a highly-optimized SAW architecture to achieve an unmatched blend of performance, size, efficiency, and cost. When the transmitter is paired with a matching LR Series receiver, a highly reliable wireless link is formed, capable of transferring serial data at rates of up to 5,000bps over distances up to 3,000 feet (LR). 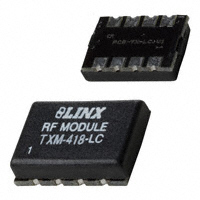 Like all Linx modules, the LC Series requires no tuning or external RF components (except an antenna).